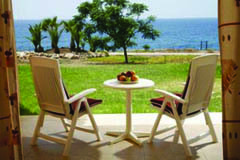 Akteon Holiday Village occupies a delightful cliff top position, with fabulous views to the sea. 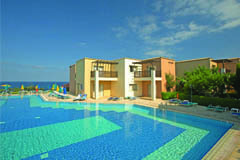 It also benefits from a very quiet location on the outskirts of Paphos just a few minutes’ drive from the picturesque harbour and the delightful Coral Bay. Akteon Holiday Village is a fantastic cliff walk, along which there are some beautiful little bays and tiny beaches ideal for those wishing to lounge around in the sun, soaking up the tranquil atmosphere. The hotel has 232 rooms altogether and each room has been decorated to a high standard, offering you a relaxing interior, perfect after a long day enjoying the Cypriot sun. All rooms are fully equipped with amenities such as a direct dial telephone, satellite TV, radio, centrally controlled air-conditioning and heating, a safe, lounge and a balcony and a fully equipped kitchen. 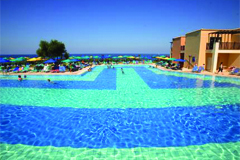 The Akteon Holiday Village offers a A La Carte restaurant and a pool restaurant/bar, for guests to take advantage of and enjoy during their stay. The hotel offers one conference room that caters for up to 600 persons and can be organized to host seminars, meetings and conferences of various sizes. A wide variety of leisure and sport facilities offers guests the opportunity to engage in energetic and fun activities on the multipurpose courts, the gaming area or even enjoy some wet sports. There is Wi-Fi and a playground for the children too. By utilizing services rendered by and / or using any of the EasyPlatform Ltd. websites (in the following terms these sites, supplementary websites, any software and services provided by EasyPlatform Ltd. will be described as “service”, “site”, “system”, “software”, “application”) or any other services provided through EasyPlatform Ltd., you are agreeing to use the EasyPlatform Ltd. web sites and services according to and to be bound by the following Terms of Service. In connection with the provision of Services, EasyPlatform Ltd. may, where appropriate, contract for or otherwise obtain goods and services from trusted third party providers. EasyPlatform Ltd. reserves the right to periodically update or modify the Terms of Service without prior notice. Additions to rendered services, upgrades, new features, implementation and release of new tools shall be subject to the Terms of Service. By using services provided by EasyPlatform Ltd. after such changes have been implemented you give consent to such changes. If you do not agree with the changes you can cancel your account (if all prior obligations have been completed) at any time. For the purposes of this Agreement / Terms of Service, services rendered by or related to EasyPlatform Ltd. for Conference Organisers and / or Conference Participants which may include website creation, hosting, software provision, accommodation / travel services (air or ground) / conference / association management services will be referred to as “Services”. “Conference Organiser” refers to a natural person, partnership, group, association or incorporated organisation which creates, has the rights to or manages a conference / association using Services provided by EasyPlatform Ltd and its affiliates / collaborators / subcontractors. “Conference Participant” and “Association member” refer to a natural person who sets up an account directly or through an affiliated group / personal assistant / authorized person or third party with EasyPlatform Ltd. to access a conference or association that has already been created or is managed by a Conference Organiser and / or an Association Manager. “GDPR” refers to the General Data Protection Regulation, 679/2016, of the European Union. For the purposes of GDPR, EasyPlatform Ltd. is defined as both a “Data Processor” and a “Data Controller” as the case may require. The headings in this Agreement / Terms of Service are for ease of reference only and shall not be taken into account in the construction or interpretation of any provision to which they refer. “EasyPlatform Ltd.” (referred to as “we”, “us”, “our”, “Easy Platform” or “EasyPlatform Ltd.” in this agreement) primarily refers to EasyPlatform Ltd., the main operating company of the Easy Platform group, and, where appropriate, to other companies in the Easy Platform group or other entities over which Easy Platform exercises management control. Easy Platform is the “data processor” and / or “data controller” of all personal information that is collected and used about Easy Platform customers for the purposes of rendered services. Easy Platform is registered in Cyprus with registration number HE273078 and registered offices at Michael Georgalla 10, 1095, Nicosia, Cyprus – P.O. Box 24430, 1704, Nicosia, Cyprus. In cases where a third party’s details are entered into the system by another person, (that person being a secretary or a colleague) for the purposes of participation to the conference or for the submission of joint work, (abstract and / or paper), then that person may be designated as the “Data Controller” for those particular actions. It is understood that the third party will retain all rights as those are derived from GDPR and EasyPlatform Ltd. will always act in accordance to the regulation. Depending on the needs of a conference, the Conference Organiser and / or an Association Manager may be designated as the “Data Controller”. Depending on the needs of an association managing members through Easy Platform, the Association or Association Manager may be designated as the “Data Controller”. Personal data means any information relating to you which allows us to identify you, such as your title, full name, contact details, order reference number, personal notes, payment details and information about your access to our website or services. We may collect personal and / or sensitive data from you when you create an order with us (either directly or indirectly through approved third parties), create an EasyPlatform account, use our website and / or App / and / or Services and other websites accessible through our website and / or App and / or Services, participate in a survey, or when you contact us. The communications you exchange with us or direct to us personally or via letters, emails, online chat services, phone calls, and social media. Location, including real-time geographic location of your computer or device through GPS, Bluetooth, and your IP Address, along with crowd-sourced Wi-Fi hotspot and cell tower locations, if you use location-based features for services rendered by EasyPlatform and turn on the Location Services settings on your device and computer. Personal details about your physical or mental health, alleged commission or conviction of criminal offences are considered “sensitive” personal data under applicable data protection laws. We will process any such data only if you have given your explicit consent, or it is necessary (for instance if you request special assistance), or you have deliberately made it public. We follow strict security procedures in the storage and disclosure of your personal data, and to protect it against accidental loss, destruction or damage. The data you provide to us through our online services is protected using SSL (Secure Socket Layer) technology. SSL is the industry standard method of encrypting personal information and credit card details so that they can be securely transferred over the Internet. All payment details are transmitted over SSL to our Credit Card processor via their payment gateway and stored in compliance with Payment Card Industry Data Security Standards (PCI DSS). We do not store or have access to credit card numbers for payments made through our online services. Marketing: from time to time we may contact you with information regarding conferences or services related to your orders or accounts made through EasyPlatform and / or attended Conference and / or participated Association . You will have the choice to opt in or opt out of receiving such communications. You will also be given the opportunity on every e-communication that we send you to indicate that you no longer wish to receive our direct promotional material. We do not sell, trade, or otherwise transfer to outside parties your personally identifiable information. This does not include trusted third parties who assist us in operating our website, conducting our business, or rendering requested services. We may also release your information when we believe release is appropriate to comply with the law, enforce our site policies, or protect ours or others’ rights, property, or safety. EasyPlatform will not sell, trade, or otherwise transfer to outside parties confidential information unless explicitly approved by you for provision of requested services. We will not retain your data longer than it is necessary to fulfil the purpose it is being processed for. To determine the appropriate retention period, we consider the amount, nature and sensitivity of the personal data, the purposes for which we process it and whether we can achieve those purposes through other means. We also consider periods for which we might need to retain personal data in order to meet our legal obligations, financial audits, deal with complaints, queries and to protect our legal rights in the event of a claim being made. Conference Organisers and / or Associations and/ or Other Service Providers that will use our website and / or services to provide a service to you. Our trusted third party ancillary partners (identified on our website or on the conference website) who offer conference related products: If you choose to purchase products or services offered on our websites by third parties such as Accommodation, you may be a customer of both EasyPlatform and these third parties, and we and our partners may collect and share information about you, such as your contact details and your billing information. We are not responsible for third parties’ use of your personal data where such use is permitted for their own purposes. Please consult their privacy policies for further information. Please note that one Full Registration is required for every accepted paper and / or abstract unless otherwise specified by the Conference Organisers at the specific conference website. Conference Organisers reserve the right not to publish a submitted paper and / or abstract unless a Full Payment regarding this paper and / or abstract is received. Registration to the conference is done online. Participants may register and come back as many times as they like (up to the closing of the registration period) to make any amendments. Participants are offered three distinct possibilities for payment. Confirmation of registration at the conference will only be sent out only once the payment is received by the conference organizers. Instant payment by credit card (currently VISA and MASTERCARD are the only credit cards accepted by our system). A Final Confirmation will be sent instantly as payment is received. Payment by Bank transfer. Participants may select this option and they will instantly be sent a Preliminary Confirmation. Their registration and any other services requested will not be confirmed until payment is received into our account. Usually Bank transfers take a maximum of four working days to complete. Once the money is received into our account, then we will send a Final Confirmation and all items requested will be finally confirmed accordingly. Payment by Other methods. Participants may select this option, but they will need to specify payment method (i.e. payment by their Organization, Banker`s draft, etc.). Once this option is selected, they will instantly be sent a Preliminary Confirmation. Their registration and any other services requested will not be confirmed until payment is received into our account. Usually Bank transfers take a maximum of four working days to complete. Once the money is received into our account, then we will send a Final Confirmation and all items requested will be finally confirmed accordingly. In case that participants choose the latter two payment possibilities, then it will be their responsibility to track payment and make sure that their details and references are included in the payment details. "EasyPlatform" will not be able to guarantee any of the selections made during Registration unless a full payment is received into our bank account. Please note that in case of Bank Transfers, all bank transfer charges are the responsibility of the conference participants. In case that any charges are deducted from the amounts payable, these will be considered due and should be paid prior or during registration. In case that participants would like to use alternative accommodation during the conference, or would like to extend their stay outside of the dates specified in the registration system, please contact us at support@easyconferences.org. With regard to optional excursions and events, please note that we need a minimum participation of 25 people, unless otherwise mentioned on the specific conference website. In case that the minimum number of people is not reached, these optional excursions and events will be cancelled and participants will be refunded after the conclusion of the conference. Every effort is made on behalf of EasyPlatform to collaborate with prestigious third parties for the provision of additional services required like transfers, excursions and car hire. Any deviationfrom the service is the responsibility of the third party provider and is covered with the specific contract signed between participants and third party companies. EasyPlatform cannot be held responsible for a breach of these contracts, but will be happy to mediate in order to resolve any disputes; please contact us at support@easyconferences.org. Meal tickets or additional services for accompanying persons can be purchased by filling the appropriate sections on the registration form. Please indicate interest for optional excursions in the notes section. In case of increased interest we will compile a program for accompanying persons and we will let all interested parties know prior to the conference. One full registration is required for every accepted paper and / or abstract unless otherwise specified by Conference Organizers. Authors and other participants may cancel their registration up to the author registration deadline. A EUR 50 administrative charge will apply. Registration fees are non-refundable for all cancellations after the author registration deadline has elapsed. Conference Organizers will accept a substitute at no additional cost, if a registered conference participant is unable to attend the conference. In case of cancellation 2 weeks in advance 50% refund of total amount paid. In case of cancelation onsite or a no show, no refund will be given. Unless otherwise specified, Accommodation prices are inclusive of Bed & Breakfast, all taxes and VAT. In case of no shows, participants will be charged for the full amount. In case of cancellation, if we are informed 6 weeks in advance we will apply a EUR50 administration charge. In case of cancellation 3 - 5 weeks in advance we will apply a charge equivalent to one night’s accommodation. 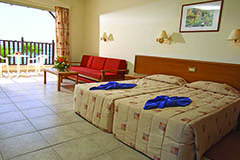 In case of cancellation less than 3 week in advance we will apply a charge equivalent to three nights’ accommodation. In case of cancellation upon group arrival or no show, no refund will be given. Any last minute changes (less than 72 hours) will be subject to added fees according to specific requests. Any changes will be subject to hotel availability and conditions. In case of one day car hire "One Day Supplement" is added. In case that pick up/drop off location is different from arriving/departing airport, please indicate accordingly in the notes section. You are entitled to cancel or terminate your EasyPlatform account, as long as the data, and more specifically the financial data, is not required for government, tax and / or audit purposes. In case the data is not required for any official purposes, all your content will be deleted from the service after 30 days. Upon request, within the 30 day period, EasyPlatform will provide you with a file containing your conference data and any abstracts and / or papers and / or any other material uploaded by you on EasyPlatform. Upon deletion this information cannot be recovered. Your personal data related to financial or other transactions within the system will not be deleted if these have created any obligations for EasyPlatform, its subsidiaries and/or any of its collaborators towards the government and / or any other authorities. Right to know that EasyPlatform uses partner companies to provide requested services, which use (part of) their personal data for service provision and which permit EasyPlatform to optimise services rendered. Request information about whether we hold personal information about you, and, if so, how it is used. Request erasure of your personal information. This enables you to ask us to delete or remove personal information where there is no good or legal obligation for us continuing to process it. You also have the right to ask us to delete or remove your personal information where you have exercised your right to object to processing (see below). Object to automated decision-making including profiling, that is not to be subject of any automated decision-making by us using your personal information or profiling of you. Request transfer of your personal information in an electronic and structured form to you or to another party (commonly known as a right to “data portability”). This enables you to take your data from us in an electronically useable format and to be able to transfer your data to another party in an electronically useable format. Withdraw consent. In the limited circumstances where you may have provided your consent to the collection, processing and transfer of your personal information for a specific purpose, you have the right to withdraw your consent for that specific processing at any time. Once we have received notification that you have withdrawn your consent, we will no longer process your information for the purpose or purposes you originally agreed to, unless we have another legitimate basis for doing so in law. If you want to exercise any of these rights, then please submit a request at info@easyconferences.org or contact us by post at P.O. Box 24430, 1704, Nicosia, Cyprus. A cookie is a small text file that is placed on a computer or other device and is used to identify the user or device and to collect or locally store information. Cookies are typically assigned to one of four categories, depending on their function and intended purpose: strictly necessary cookies, performance cookies, functional cookies, and cookies for targeting and advertising purposes. You may set your browser to block or alert you about cookies; our primary aim is not to utilise cookies unless explicitly requested by an Association or a Conference Organiser in order not to degrade your experience and to not store any personally identifiable information about you on your device. These cookies are necessary for a website to function and switching them off may cause issues while browsing or using services. EasyPlatform does not set any strictly-necessary cookies in order to provide a uniform experience to visitors. Cookies of this type are used to count visits and general traffic to improve performance of a website or audience capture. These cookies let us / an Association / the Conference Organisers to improve services for participants. Information collected can include for example the browser and operating system used, number of visits and average duration, and specific pages viewed. Not allowing cookies of this type will not degrade your experience. Cookies of this type enable websites to provide enhanced functionality and to remember choices you have made for repeated future use. These cookies may be used by us or a third party to enhance the functionality of a website (for example to display a video). If you do not allow this type of cookies you may experience a slightly degraded experience. Cookies of this type track browsing habits and are used to deliver targeted advertising. These cookies may be used to build a profile of your interested to show you relevant adverts on other sites. Easy Platform does not utilise Targeting and Advertising cookies on its websites.